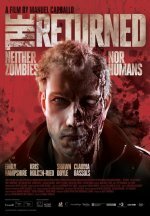 The Returned Movie Neither zombie nor humans. The Returned release date was Friday, February 14, 2014. Set in a post-zombie world where a treatment called the “Return Protein” can stop the spread of the virus if injected quickly after infection, but cannot cure it. With daily injections, the “Returned” are able to live relatively normal lives, but with brutal attacks at the hands of Anti-Return groups and rumors that protein stock is running low, the world is again on the brink of chaos. In the midst of this turmoil are Alex (Kris Holden-Reid) and Kate (Emily Hampshire), a young, successful and enviable couple that are hiding a long held secret – Alex is Returned. Suspicious that a government order for all the Returned to report to a secure medical facility ‘for their own safety’, the couple flees, taking with them all the doses of “Return Protein” they have. Now in a race against the clock and few places to turn, they must face their worst fears and come to grips with the reality that if they are neither human nor zombies, who exactly are the Returned?